Gastrointestinal Cancers Symposium, San Francisco, CA, USA · 2018, Chajon E. et al. The physical mode of action of NBTXR3 may represent a breakthrough approach for the local treatment of liver cancers, as it does not engage liver and renal functions, i.e. nanoparticles are not metabolized and not excreted by kidney. A phase I/II trial has been implemented for the treatment of hepatocellular carcinoma and liver metastasis [NCT02721056]. At the 2018 Gastrointestinal Cancers Symposium (also known as ASCO-GI) at San Francisco (CA, USA), Dr. Chajon presented preliminary results on this study. Overall, the injection of NBTXR3 was safe and well tolerated at these levels. Patients received the planned RT. No DLT occurred. Enrollment is now opened at the 22% level. 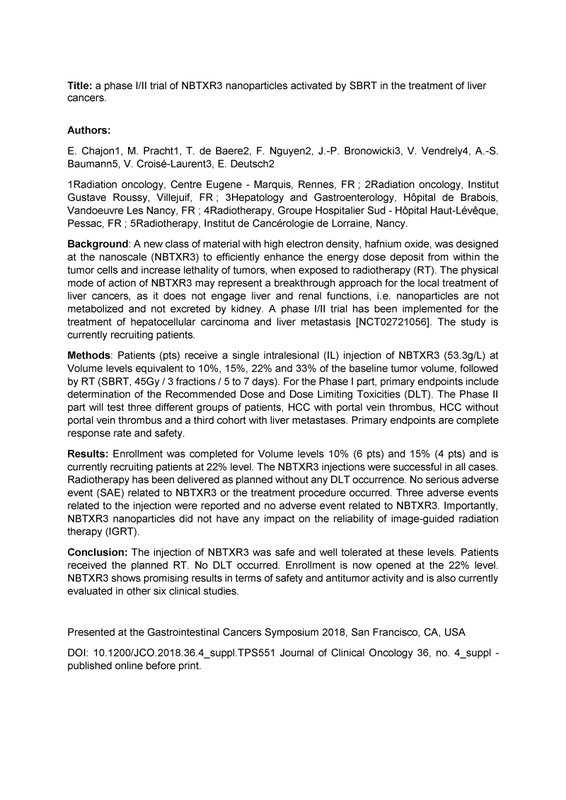 NBTXR3 shows promising results in terms of safety and antitumor activity and is also currently evaluated in other six clinical studies.